Baybayin (Tagalog pronunciation: [bai̯ˈba:jɪn]; pre-virama: ᜊᜊᜌᜒ, post-virama: ᜊᜌ᜔ᜊᜌᜒᜈ᜔, kudlit + pamudpod: ᜊᜌ᜔ᜊᜌᜒᜈ᜴) is an ancient script used primarily by the Tagalog people. Baybayin is an indigenous Indic script that has been widely used in traditional Tagalog domains. It is one of many suyat scripts in the Philippines. It continued to be used during the early part of the Spanish colonization of the Philippines until largely being supplanted by usage of the Latin alphabet. Baybayin is well known because it was carefully documented by scribes during the colonial era. The term baybayín literally means "to spell, write, and syllabize" in Tagalog. Baybayin was extensively documented by the Spanish. Some have incorrectly attributed the name Alibata to it, but that term was coined by Paul Rodríguez Verzosa after the arrangement of letters of the Arabic alphabet (alif, ba, ta (alibata), "f" having been eliminated for euphony's sake). For the Visayans, it is called Kudlit-kabadlit. Baybayin was noted by the Spanish priest Pedro Chirino in 1604 and Antonio de Morga in 1609 to be known by most Filipinos, and was generally used for personal writings, poetry, etc. However, according to William Henry Scott, there were some datus from the 1590s who could not sign affidavits or oaths, and witnesses who could not sign land deeds in the 1620s. The best known evidence of where this Indic script we call today as Baybayin came about is from the "abecedaries" evidence. 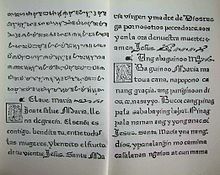 It is an example of letters of the script arranged more or less in the order the Spaniards knew, reproduced by the Spanish and other observers in the different regions of Luzon and Visayas. Another source of evidence are the archival documents preserved and recovered. From these two sources, it is clear that the Baybayin script was used in Luzon, Palawan, Mindoro, as far as Pangasinan in the north, and in Ilocos, Panay, Leyte, and Iloilo, but there are no proof supporting that Baybayin reached Mindanao. From what is available, it seems clear that the Luzon and Palawan varieties have started to develop in different ways in the 1500s, way before the Spaniards conquered what we know today as the Philippines. This puts Luzon and Palawan as the oldest regions where Baybayin was and is used. It is also notable that the variety used in Pampanga had already developed special shapes for four letters by the early 1600s, different from the ones used elsewhere. It is equally important to note that this ancient Baybayin Kapampangan variety is very different from the experiment called "modern Kulitan" which was taught in the late 1990s. So we can say that there were three somewhat distinct varieties of a single script in the late 1500s and 1600s, though they could not be described as three different scripts any more than the different styles of Latin script across medieval or modern Europe with their slightly different sets of letters and spelling systems. The only modern scripts that descended directly from the original Baybayin script through natural development are the Pala'wan script inherited from the Tagbanwa in Palawan, the Buhid and Hanunóo scripts in Mindoro, the ancient Kapampangan script used in the 1600s but has been supplanted by a constructed script called "modern Kulitan", and of course the Tagalog script. There is no evidence for any other regional scripts; like the modern Kulitan experiment in Pampanga. Any other scripts are recent inventions based on one or another of the abecedaries from old Spanish descriptions. The confusion over the use of marks may have contributed to the demise of Baybayin over time. The desire of Francisco Lopez (1620) for Baybayin to conform to the Spanish alfabetos paved the way for the invention of a cross sign. Such introduction was uniquely a standalone event that was blindly copied by succeeding writers up to the present. Sevilla and Alvero (1939) said, “The marks required in the formation of syllables are: the tuldok or point (.) and the bawas or minus sign (-).” The bawas or minus sign (-) that is placed before the script to remove the paired vowel appears more logical than the cross or plus sign (+) of Lopez. Historically Southeast Asia was under the influence of Ancient India, where numerous Indianized principalities and empires flourished for several centuries in Thailand, Indonesia, Malaysia, Singapore, Philippines, Cambodia and Vietnam. The influence of Indian culture into these areas was given the term indianization. French archaeologist, George Coedes, defined it as the expansion of an organized culture that was framed upon Indian originations of royalty, Hinduism and Buddhism and the Sanskrit dialect. This can be seen in the Indianization of Southeast Asia, spread of Hinduism and Buddhism. Indian diaspora, both ancient (PIO) and current (NRI), played an ongoing key role as professionals, traders, priests and warriors. Indian honorifics also influenced the Malay, Thai, Filipino and Indonesian honorifics. Examples of these include Raja, Rani, Maharlika, Datu, etc. which were transmitted from Indian culture to Philippines via Malays and Srivijaya empire. Laguna Copperplate Inscription, a legal document inscribed on a copper plate in 900 AD, is the earliest known written document found in the Philippines, is written in Indian Sanskrit and Brahmi script based Indonesian Kawi script. It is a legal document with the inscribed date of Saka era 822, corresponding to April 21, 900 AD Laguna Copperplate Inscription. It was written in the Kawi script in a variety of Old Malay containing numerous loanwords from Sanskrit and a few non-Malay vocabulary elements whose origin is ambiguous between Old Javanese and Old Tagalog. One hypothesis therefore reasons that, since Kawi is the earliest attestation of writing on the Philippines, then Baybayin may have descended from Kawi or vice versa. It is the kawi inspired ancient alphabet of the people of Baybay in the Lakanate of Lawan used to write letters to relatives in far places where they migrate. Scott mentioned the Bingi of Lawan siday (local epic) originally written in Baybay, a place in ancient Lawan.It is believed that there were at least 16 different types of writing systems present around the Philippines prior to our colonization. Baybayin is just one of them, which was said to be of widespread use among coastal groups such as the Tagalog, Bisaya, Iloko, Pangasinan, Bikol, and Pampanga around the 16th century. One theory is that “Baybayin” got its name from a place or a word “baybay,” or seashore in ancient Tagalog and present Waray dialect (Casal,CNN). Many of the writing systems of Southeast Asia descended from ancient scripts used in India over 2000 years ago. Although Baybayin shares some important features with these scripts, such as all the consonants being pronounced with the vowel a and the use of special marks to change this sound, there is no evidence that it is so old. But other sources say that the Visayans derived their writing system from those of Toba, Borneo, Celebes, Ancient Java, and from the Edicts of the ancient Indian emperor Ashoka. The Bengali script was a precursor to devanāgarī. This hypothesis states that a version of this script was introduced to the Philippines via Bengal, before ultimately evolving into baybayin. Finally, an early Cham script from Champa — in what is now southern Vietnam and southeastern Cambodia — could have been introduced or borrowed and adapted into Baybayin. Like Japan and Korea, the Philippines also had a sealing culture prior to Spanish colonization. However, when the Spaniards succeeded in colonizing the islands, they abolished the practice and burned all documents they captured from the natives while forcefully establishing a Roman Catholic-based rule. Records on Philippine seals were forgotten until in the 1970s when actual ancient seals made of ivory were found in an archaeological site in Butuan. The seal, now known as the Butuan Ivory Seal, has been declared as a National Cultural Treasure. The seal is inscribed with the word "Butwan" through a native suyat script. The discovery of the seal proved the theory that pre-colonial Filipinos, or at least in coastal areas, used seals on paper. Before the discovery of the seal, it was only thought that ancient Filipinos used bamboo, metal, bark, and leaves for writing. The presence of paper documents in the classical era of the Philippines is also backed by a research of Otley Beyer stating that Spanish friars 'boasted' about burning ancient Philippine documents with suyat inscriptions, one of the reasons why ancient documents from the Philippines are almost non-existent in present time. The ivory seal is now housed at the National Museum of the Philippines. Nowadays, younger generations are trying to revive the usage of seals, notably in signing pieces of art such as drawings, paintings, and literary works. On occasion, "baybayin" refers to other indigenous writing in the Philippines that are collectively called suyat, including Buhid, Hanunó'o, Tagbanwa (Apurahuano), Kulitan, and others. Cultural organizations such as Sanghabi and the Heritage Conservation Society recommend that the collection of distinct scripts used by various indigenous groups in the Philippines, including baybayin, be called suyat, which a neutral term for any script. The writing system is an abugida system using consonant-vowel combinations. Each character, written in its basic form, is a consonant ending with the vowel "A". To produce consonants ending with the other vowel sounds, a mark is placed either above the consonant (to produce an "E" or "I" sound) or below the consonant (to produce an "O" or "U" sound). The mark is called a kudlit. The kudlit does not apply to stand-alone vowels. Vowels themselves have their own glyphs. There is only one symbol for D or R as they were allophones in most languages of the Philippines, where R occurred in intervocalic positions and D occurred elsewhere. The grammatical rule has survived in modern Filipino, so that when a d is between two vowels, it becomes an r, as in the words dangál (honour) and marangál (honourable), or dunong (knowledge) and marunong (knowledgeable), and even raw for daw (he said, she said, they said, it was said, allegedly, reportedly, supposedly) and rin for din (also, too) after vowels. This variant of the script is not used for Ilokano, Pangasinan, Bikolano, and other Philippine languages to name a few, as these languages have separate symbols for D and R.
The Monreal stone, which is the centerpiece at the Baybayin section of the National Museum of Anthropology. The Ticao stone inscription, also known as the Monreal stone or Rizal stone, is a limestone tablet that contains Baybayin characters. Found by pupils of Rizal Elementary School on Ticao Island in Monreal town, Masbate, which had scraped the mud off their shoes and slippers on two irregular shaped limestone tablets before entering their classroom, they are now housed at a section of the National Museum, which weighs 30 kilos, is 11 centimeters thick, 54 cm long and 44 cm wide while the other is 6 cm thick, 20 cm long and 18 cm wide. Words written in baybayin were written in a continuous flow, and the only form of punctuation was a single vertical line (᜵), or more often, a pair of vertical lines (᜶). These vertical lines fulfill the function of a comma, period, or unpredictably separate sets of words. The insignia of the Order of Lakandula contains an inscription with Baybayin characters represents the name Lakandula. It is used in the most current New Generation Currency series of the Philippine peso issued in the last quarter of 2010. The word used in the bills was "Pilipino" (ᜉᜒᜎᜒᜉᜒᜈᜓ). It is also used in Philippine passports, specifically the latest e-passport edition issued 11 August 2009 onwards. The odd pages of pages 3–43 have "ᜀᜅ᜔ ᜃᜆᜓᜏᜒᜍᜈ᜔ ᜀᜌ᜔ ᜈᜄ᜔ᜉᜉᜇᜃᜒᜎ ᜐ ᜁᜐᜅ᜔ ᜊᜌᜈ᜔" ("Ang katuwiran ay nagpapadakila sa isang bayan"/"Righteousness exalts a nation") in reference to Proverbs 14:34. Baybayin influence may also explain the preference for making acronyms from initial consonant-vowel pairs of the component words, rather than the more common use of just the first letter. A number of legislative bills have been proposed periodically aiming to promote the writing system, none of which have yet been passed into law. Among them is the "National Writing System Act" (House Bill 1022/Senate Bill 433). The lyrics of Lupang Hinirang in Baybayin rendering. Flag of Katipunan in Magdiwang faction, with the Ka baybayin character. Seal of the National Historical Commission of the Philippines. Emblem of the Armed Forces of the Philippines. Seal of the Philippine Army. Logo of the National Library of the Philippines. The Baybayin text reads as karunungan (wisdom). Logo of the National Museum of the Philippines. Logo of the Cultural Center of the Philippines. The words and sentences of Old Tagalog are the roots of the Modern Tagalog language. Some of the words and sentences have evolved over time (like the word Babuy or Pig, which became Baboy in modern Tagalog), but some of the words in Old Tagalog (like Budhi (conscience) and Hari or King), have survived and are in common use in Modern Tagalog. Baybayin writing makes use of only one punctuation mark, the Philippine double punctuation (᜶). Yamang ‘di nagkakaunawaan ay mag-pakahinahon. Mámahalin kitá hanggáng sa pumutí ang buhók ko. A O/U E/I H P K S L T N B M G D/R Y NG W.
A I U Ka Ga Nga Ta Da Na Pa Ba Ma Ya La Wa Sa Ha. Dito sa lupà para nang sa langit. Bigyán mo kamí ngayón ng aming kakanin sa araw-araw. Para nang pagpapatawad namin sa mga nagkakasala sa amin. At iadyâ mo kamí sa masama. Siya nawâ. It is possible to type Baybayin directly from the keyboard without the need to use online typepads. The Philippines Unicode Keyboard Layout includes different sets of Baybayin layout for different keyboard users: QWERTY, Capewell-Dvorak, Capewell-QWERF 2006, Colemak, and Dvorak, all available in Microsoft Windows and GNU/Linux 32-bit and 64-bit installations. ^ "Tagalog (Baybayin)". SIL International. Retrieved October 10, 2014. ^ a b c d e f g Is Baybayin really a writing system in the entire pre-hispanic Philippines? What's the basis for making it a national writing system if pre-hispanic kingdoms weren’t homogenous? ^ Scott 1984, pp. 57–58. ^ Duka, C (2008). Struggle for Freedom' 2008 Ed. Rex. pp. 32–33. ISBN 978-971-23-5045-0. ^ a b c d Morrow, Paul. "Baybayin, the Ancient Philippine script". MTS. Archived from the original on August 8, 2010. Retrieved September 4, 2008. .
^ UST Baybayin collection shown to public, Baybayin, retrieved June 18, 2012 [permanent dead link]. ^ "Cochin Palm Leaf Fiscals". Princely States Report > Archived Features. 2001-04-01. Archived from the original on 2017-01-13. Retrieved 2017-01-25. ^ Lazaro, David (2009-10-23). "The Fundamentals of Baybayin". BakitWhy. Retrieved 2017-01-25 – via The Bathala Project. ^ Tagalog script Archived August 23, 2008, at the Wayback Machine. Accessed September 2, 2008. ^ P. Domingo Ezguerra (1601–1670) (1747) [c. 1663]. Arte de la lengua bisaya de la provincia de Leyte. apendice por el P. Constantino Bayle. Imp. de la Compañía de Jesús. ^ "Chapter 17: Indonesia and Oceania, Philippine Scripts" (PDF). Unicode Consortium. March 2019. ^ "Philippines Unicode Keyboard Layout". techmagus™.